Congress Rajya Sabha MP Abhishek Manu Singhvi said: "Facing a complete rout in the Assembly elections in the five states, the Modi government is back to its dirty tricks and malicious tactics." The Congress on Saturday termed the Enforcement Directorate (ED) searches at the premises of some persons linked to Congress President Rahul Gandhi's brother-in-law Robert Vadra as "blind vendetta" to settle political scores. Addressing a press conference at the party headquarters, Congress Rajya Sabha MP Abhishek Manu Singhvi said: "Facing a complete rout in the Assembly elections in the five states, the Modi government is back to its dirty tricks and malicious tactics." Targeting the Bharatiya Janata Party (BJP)-led Central government, he said the Modi government's mask of anti-corruption crusader lies in shambles with successive scams getting uncovered over the last 54 months and zero action against fraudsters. "Instead, the only tool which is being employed by the Modi government to hide its massive failures are mudslinging, muckraking and hatchet jobs by the dirty tricks department i.e. CBI or ED, to smear opposition leaders," he said. He said the illegal raids on the premises of Vadra and his associates is another episode of these "concerted conspiracies, blind vendetta acts and web of lies" to target the Congress. His remarks came a day after the financial probe agency on Friday carried out searches at the premises of some persons linked to the firms of Vadra in connection with alleged commissions received by some people in defence deals. The searches were also carried out at the office of Skylight Hospitality in Sukhdev Vihar area of south Delhi. Slamming the government, the Congress leader said: "All constitutional, legal and administrative norms are being thrown into a dustbin to target and tarnish an individual for sheer and petty political reasons. He said the Central Bureau of Investigation, ED and Income Tax departments are acting as "slaves and bonded labours" dancing to the tunes of Prime Minister Narendra Modi. Accusing the BJP of vilifying Vadra, Singhvi said: "In last 54 months, Modi government has let loose a criminal conspiracy to vilify, denigrate and malign Vadra to settle political scores." "As all else failed, Modi government has unleashed all its agencies including ED, CBI and Income Tax to victimize Vadra in an utterly malafide manner," he said. He also alleged that the ED officers who raided the premises of Vadra's office and people linked to him had a single line brief to "flout all norms and harass". "Yesterday, in a brazen affront to the rule of law and to the Constitution, on the polling day, officers of ED from Jaipur and Delhi raided the office of Vadra at Sukhdev Vihar, New Delhi," Singhvi said, adding that it continued till Saturday 4.30 a.m. He said the residence of his associate, his sister and her in-laws at Noida were also raided - all without any FIR or search warrant. The residence of the associate's sister was also raided. The raids have been carried out in a completely illegal fashion with no employee or lawyer being permitted to enter the premises. Singhvi said that four employees were also illegally detained for this entire period. 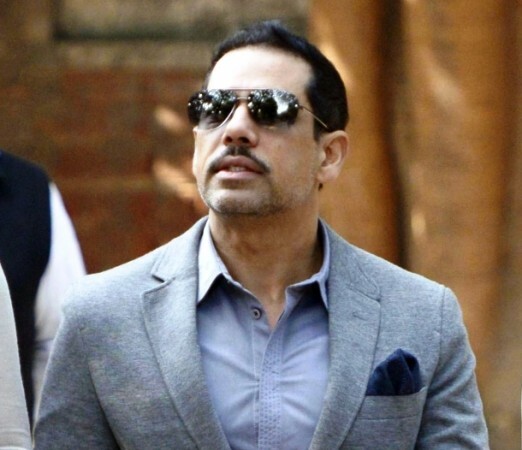 He said that Vadra through his lawyer submitted the last two sets of documents running to over 600 pages to the ED on November 26 and December 5. Singhvi said the ED officers are being used as personal slaves and political agents of the Modi government to take political revenge against opponents.